Today’s guest blogger is the Collections Manager at the Center for Archaeological Studies (CAS) at Texas State University. One of the final critical steps of any archaeological project is properly curating and safeguarding the artifacts, samples, and records for the future. Amy came to visit us recently and check on our progress. Early morning view across the bending Rio Grande just downstream from the mouth of Eagle Nest Canyon. Photo by Amy Reid. As I sit here on the front porch of the SHUMLA Campus, soaking in the gorgeous Southwest Texas morning, I reflect on my visit. All of the times I said to myself “I’ll come back” are floating through my mind. The inception of my plans to return occurred within hours of my arrival. The moment I took the first bite of the green chili chicken enchiladas that Steve Black fixed for dinner, I knew that I had to come back. As the night went on, I met the personalities that make up the crew. 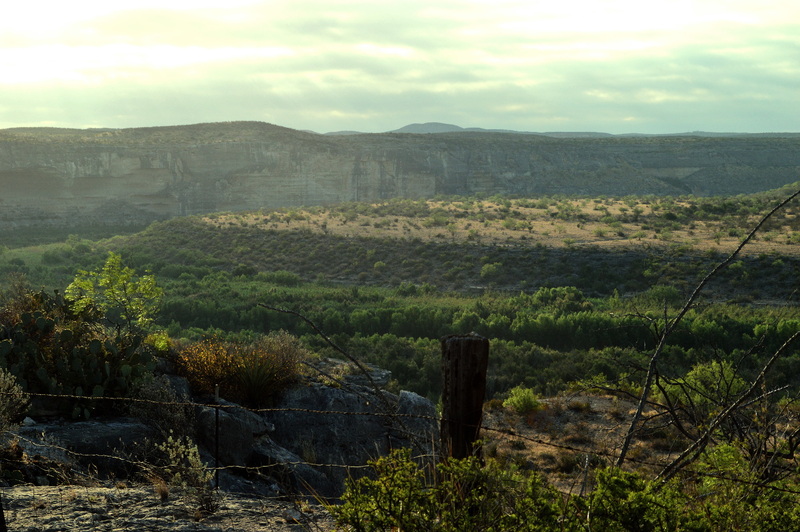 We talked about everything from the obvious subject of archaeology, to Lower Pecos wildlife. I listened happily while Logan McNatt told stories of cave expeditions, cartel encounters and mountain lion sightings to the soundtrack of Bryan’s acoustic guitar. The next day I joined the crew in the field and toured the sites. I was amazed, not only by the beauty of the canyon lined with rockshelters, but with the work that was being conducted. It was so special to witness such thorough sampling methods and documentation of complex stratigraphies. When our work was done, we cooled off in the river and talked about bears, beers, and Billy Bob Thornton (No Steve, he is not who we have to thank for the infamous Miley Cyrus). Steve Black and Amy Reid at Kelley Cave. I realize that my time here may sound more like a vacation than work, but I did have an important mission: to see the growing collection from Eagle Nest Canyon. You see, one day the artifacts and records generated from the project will likely be curated at CAS. It will then be one of the many collections I care for and provide access to for research and various public outreach activities. As a certified archaeological repository, CAS has a set of standards and guidelines for the archaeologists and lab managers who are tasked with preparing collections for final curation. Instead of expecting them to submit a flawlessly cataloged and packaged collection using only a four-page document, I have decided to take a more interactive approach to curation. No matter how detailed and clear I think my guidelines are, there are always questions or issues that need further explanation. I have started offering to visit archaeological labs and evaluate curation needs and help with some quality control checks before the collection is shipped to CAS. By doing this, I have seen a huge positive difference in the condition of the collections submitted to CAS for curation. This is why I came to see the collection that the ASWT project is amassing with their ongoing work in Eagle Nest Canyon. Part of me wishes I could say that the collection is in bad shape so that I could have a more legitimate reason for coming back than because the food is good, or because the stories are entertaining, but I can’t. The collection is in an unbelievably well-organized state of preparation and I am anticipating this to be one of the most seamless transactions CAS has ever seen. This is mostly due to the hard work and thoughtful planning of three people: Dr. Steve Black, Charles Koenig and Christina (Tina) Nielsen. Last fall Steve and Charles visited me at CAS several times asking for curation advice. For instance, they wanted to make sure that their field and analytic databases could be easily integrated with those we use at CAS for maintaining curated collections. For me it was rewarding to encounter archaeologists that truly recognize how crucial it is to consider curation issues before the fieldwork even begins. One of the things I told Steve was that he really needed to have someone in the field that had extensive lab experience. By happy coincidence, Tina is one of Steve’s first-year graduate students at TxState. 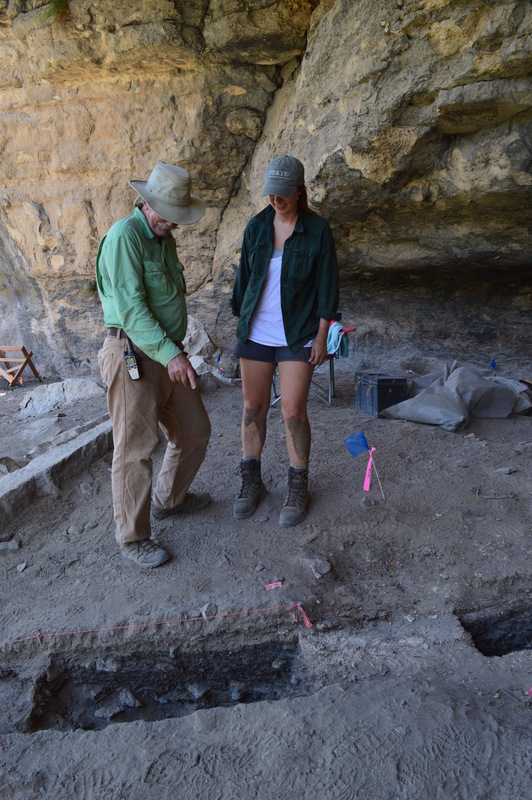 She also works as the lab manager for the Austin office of SWCA, an environmental consulting firm that carries out Cultural Resource Management archaeology. Tina is spending this semester in the field serving both as the ASWT lab manager and carrying out stratigraphic excavation and sampling at Eagle Cave that will become the basis for her thesis. Before the 2014 ENC Expedition began Tina and I were able to talk over collection and curation challenges and procedures. As the expedition start date loomed, Steve and Tina also stopped by more than once to plead for “spare” lab supplies; I couldn’t say no to my fellow Bobcat archaeologists. It was a pleasure to follow up months later and see the ASWT field lab in action. Tina’s ability to plan and implement procedures for artifact processing and cataloging, organize field records and photographs, all while directing staff and volunteers, is remarkable. She is also highly efficient and skilled at data entry, database management, artifact analysis, and developing content for public outreach projects. Charles maintains and regularly backs up the ASWT database – 800 GB and counting – including lab inventory, field number and TDS logs, SfM photos (the lion’s share), field forms, and more. All archaeological projects should be so lucky! Tina Nielsen at work in the ASWT field lab at the Shumla Campus. I truly enjoyed my visit to the ENC 2014 expedition and I hope that by sharing my experience, more archaeologists, lab managers and collection managers will be inspired to form successful partnerships and share the responsibility of proper curation. Archaeological collections are irreplaceable representations of our own cultural heritage and recognizing the importance of preserving that heritage is only the beginning. Archaeologists: It’s time we move curation higher up on our priority list and plan ahead. Curatorial staff: it’s time we stop trying to counteract unacceptable collection submissions with inflexible guidelines and impersonal interactions. Successful partnerships will help us all fulfill our current professional responsibilities and make certain that our archaeological collections continue to yield research data for centuries to come. 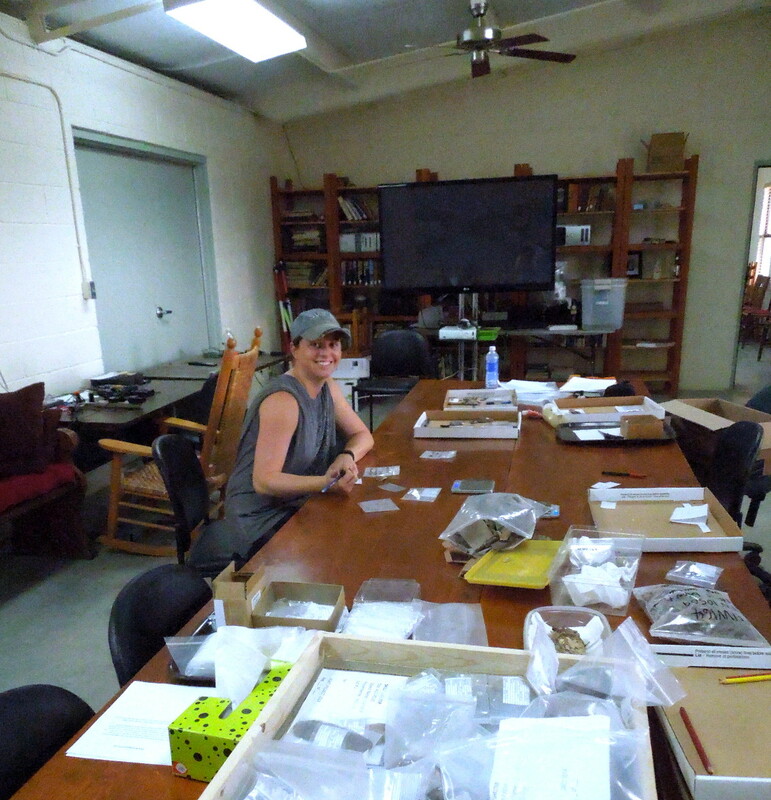 Stay tuned for a post by Tina outlining the steps she and her team are taking to prepare the ENC collection for analysis and curation, and discussing the ASWT laboratory methods that will be used to extract useful data from artifacts, plant remains, soil samples, and more. This entry was posted in Curation, Spring ENC 2014 Posts. Bookmark the permalink.